When it comes to learning a foreign language, every child is different and each of them needs a specifically tailored programme throughout their language learning process in order to be able to improve. When parents speak different languages, there will always be a majority language – the one that is also spoken at school and by the community that surrounds the child. The parents who speak the minority language might have encouraged and supported the learning of their own native language from an early age. Unfortunately, they often find that at the age of 5, when children start going to school, they stop using the minority language. Why does that happen? 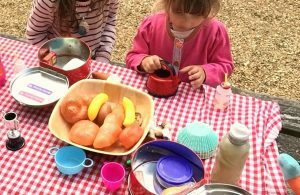 It’s because children are practical and they quickly understand which language is more useful in their everyday life – and that makes it easy for them to decide to neglect the minority language. To prevent this from happening, the parents have to be able to show them the importance of their second language, and they can do it by surrounding them with other children who speak the same language, creating an oasis where speaking the minority language is necessary – and fun! 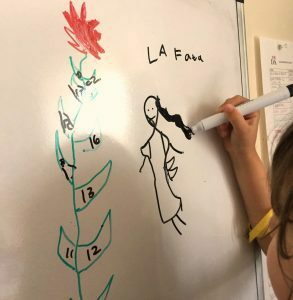 What’s special about children’s courses at La Dante? At La Dante, we made it our primary objective to create a sense of community. 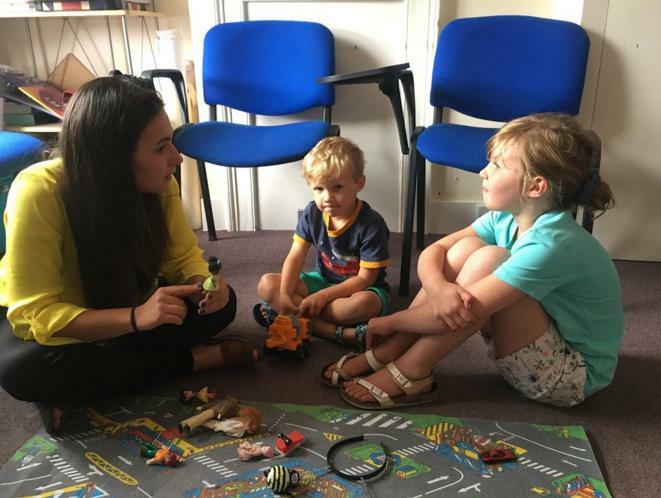 We want children and parents who come here to feel we are an enlarged Italian family in the heart of Cambridge, where learning comes naturally and where they can borrow Italian books or Italian movies and enjoy their time with other children who share their background. La Dante has been supporting families in this way since 2008 when the school was founded for this exact same reason. We have seen an incredible number of young learners studying for and successfully passing GCSE’s and A-Levels or IB exams with exceptional results… but remember it all started when they were kids and just enjoyed playing in Italian with their friends. 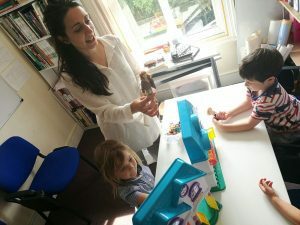 Raising a child bilingually is not easy – and that’s something our Director and Founder, Giulia Portuese-Williams, knows very well. Her sons, now at university, have gone through two different paths in their learning: one, Lorenzo, has always been enthusiastic about his mother’s language and thought it was “really cool to be Italian” once he discovered – at secondary school – that “girls love it”. While for the younger one, Luca, he didn’t see the point in speaking any language other than English, as “none of his friends at school spoke any Italian”. When he was 10, he completely dropped it. Giulia gave him the space he wanted, but she never stopped talking to him in Italian, until he started showing more interest and spontaneously chose to start learning it again when he was 14 years old. Giulia often took them on trips to Italy to visit friends, family, and certainly, their Italian nonna had a major role in keeping them attached to their Italian roots. She was the one who truly inspired them with her octopus salad and delicious food from Southern Italy. 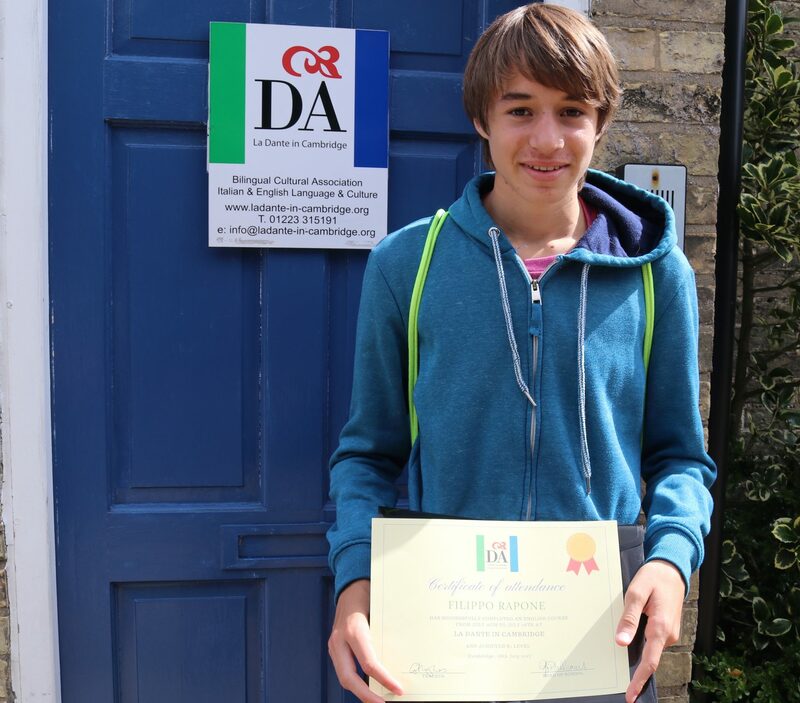 Luca and Lorenzo both came at La Dante to join our Italian classes to consolidate both written and spoken skills. They both managed to acquire a good level of Italian and confidence in speaking Italian and now they are both fluent. How do you develop your communication skills with children? We know that children are only capable of brief attention spans. Our Italian teachers are trained to vary the topics of their class often enough to keep their interest high while developing all four skills (listening, speaking, reading and writing) at different levels. In small classes, children thrive and develop the Italian language from a very young age. 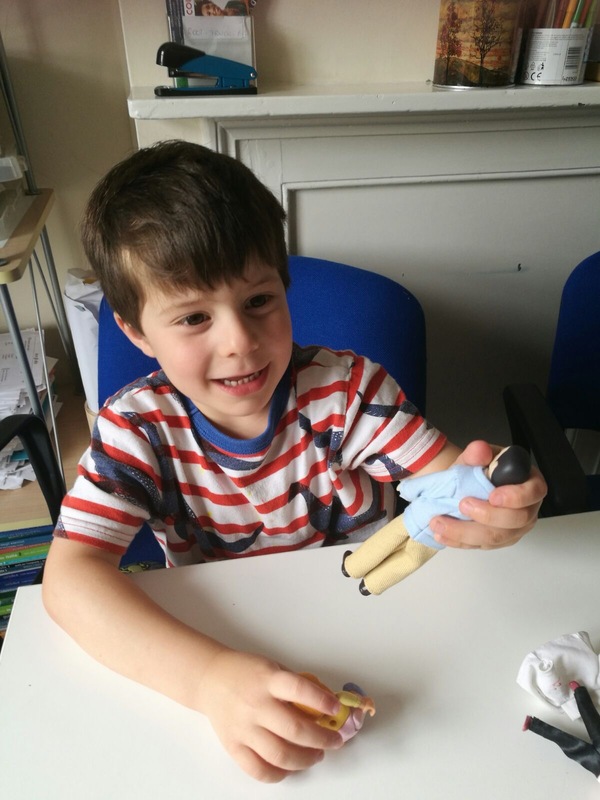 Joseph, for instance, was just 4 when he first joined one of our classes – he is now 5 and has an incredible control of language: he loves making hot chocolate with the teacher when he starts his lessons and he speaks with a perfect Italian accent. 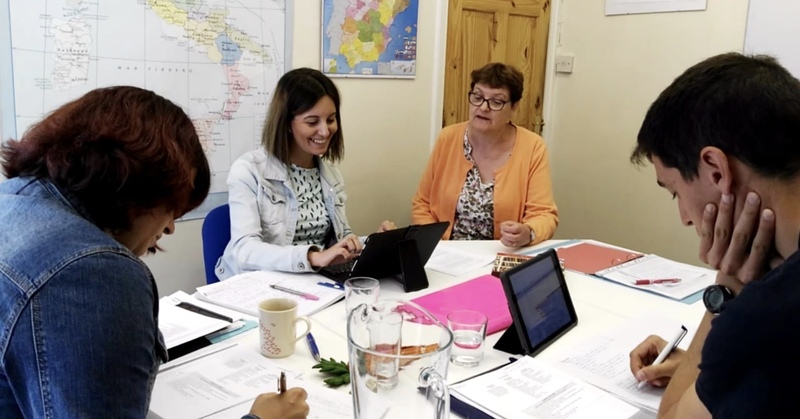 Our teachers take into account the age and needs of every young student and their personal and linguistic skills in order to develop a programme that gives them the confidence necessary to communicate in the language. What children classes is La Dante currently offering? We currently run two beginners’ courses, which are aimed at two different types of learners. The first group includes children from 4 to 5 years old and the second group is intended for children from 6 to 8 years old. Both these courses focus on the communicative approach and place particular emphasis on developing their speaking skills. All children have the possibility to learn Italian while having fun with their friends through games and creative activities, under the supervision and the guidance of our native Italian teachers. They get to know every child and give constant feedback to parents. Who is the Pinocchio bilingual project aimed at? Our brand-new Pinocchio bilingual project is aimed at children who have already achieved some level of fluency in Italian skills but need to practice their writing skills and to develop their knowledge of Italian culture, as they would if they were living in Italy. In September 2018, the new classes will start following a programme based on consolidating Italian grammar, becoming acquainted with Italian traditions, and learning the basics of History, Arts and Geography. La Dante is currently the only school that is providing this important educational service to the Anglo-Italian bilingual community in Cambridge, UK. What happens in the classrooms? In our children’s courses, children are exposed to basic Italian vocabulary and learn some simple sentences: they learn how to describe their daily routines, how to talk about their favourite food, to ask for their favourite pizza or pasta, how to talk about what they like to do in their free time, how to ask for directions, how to speak about their family and so on. Our Italian teachers make an extensive use of realia (real objects, photographs, games, role play, rhymes, songs, creative media tools, online resources and textbooks) to enhance the children’s skills. 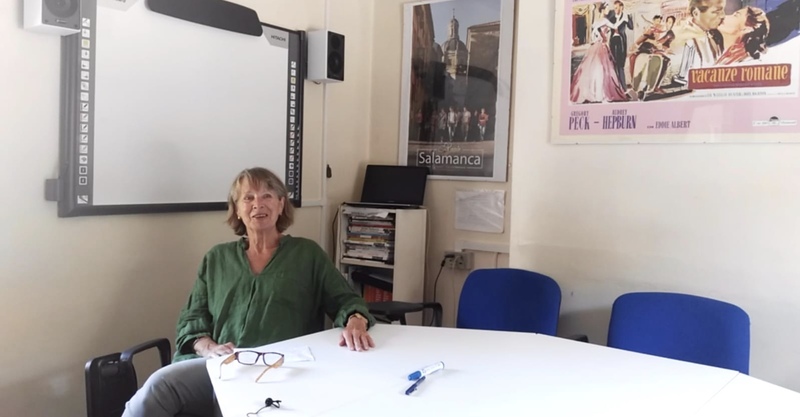 As for the bilingual classes, the programme is different: we use a textbook to give the course a better structure and to enhance their knowledge of Italian culture, History, Geography, and Arts, as well as introducing elements of grammar in a structured way. Italian teachers use a wealth of textbooks used in Italy which will consolidate grammatical skills over time. Parents’ support and encouragement are extremely important in inspiring children and in helping them with homework at home. But don’t forget: at La Dante, we believe “learning through play” is the best and most effective way to learn. 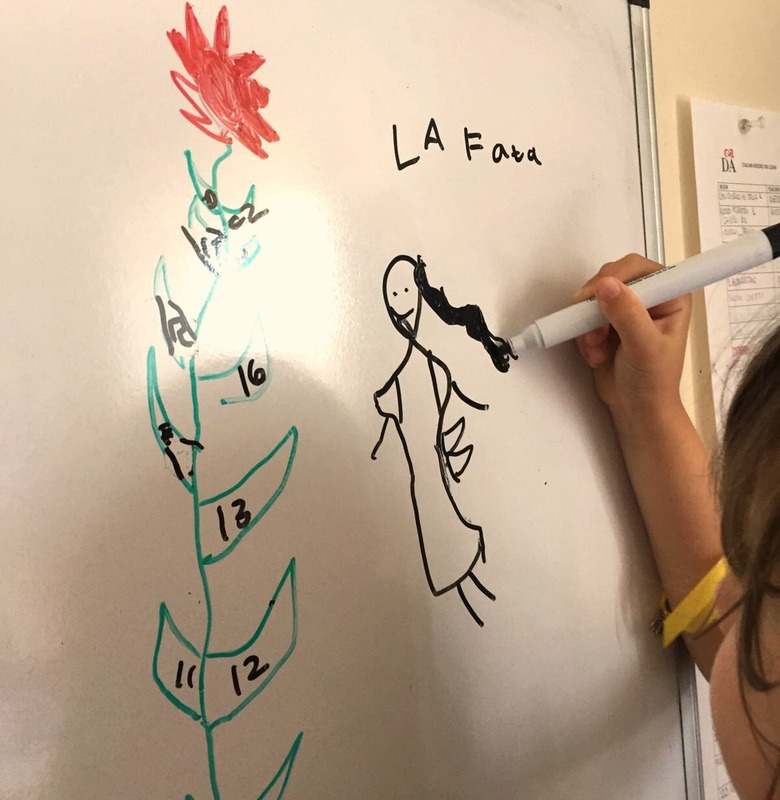 The warm and welcoming environment at La Dante is where children make friends and have fun on Saturdays while learning one of the most beautiful languages in the world! Come along to find out more – it is never too early nor too late for your children to learn another language! Give them the gift of fluency, they’ll be thanking you for life once they grow up. 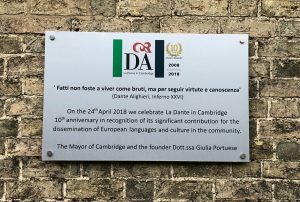 Cambridge – The European Cultural Centre La Dante in Cambridge, a not-for-profit cultural association recognised by Dante Alighieri Society in Rome (Italy), is celebrating its 10th anniversary this year. 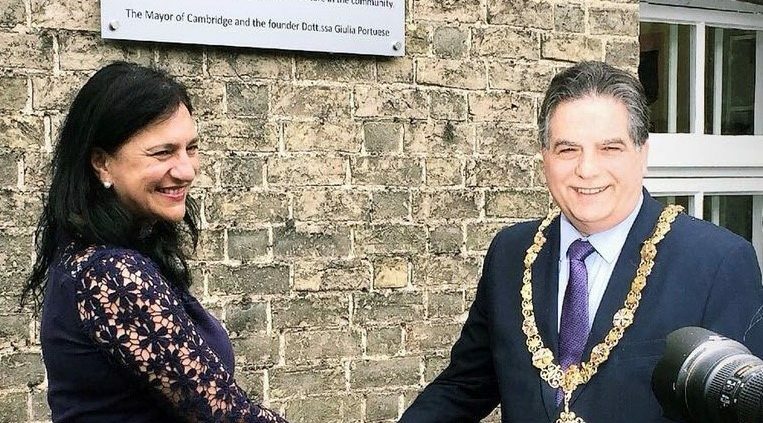 For the special occasion there will be an Italian Opera Concert on 24th February 2018, and an official unveiling of a commemorative plaque on 24th April 2018 with the Mayor of Cambridge, George Pippas. The concert, in partnership with the Cambridge University Opera Society, “L’ Elisir D’amore” by Donizetti, will take place at West Road Concert Hall, at 7.45pm (tickets available online at adcticketing.com/amore or by telephone at 01223 300085); whereas the official Ceremony with the Mayor Pippas will be held at the European Cultural Centre La Dante, in Hawthorn Way (The Lodge, Hawthorn Way, off Chesterton Road CB4 1BT) at 12,30pm. 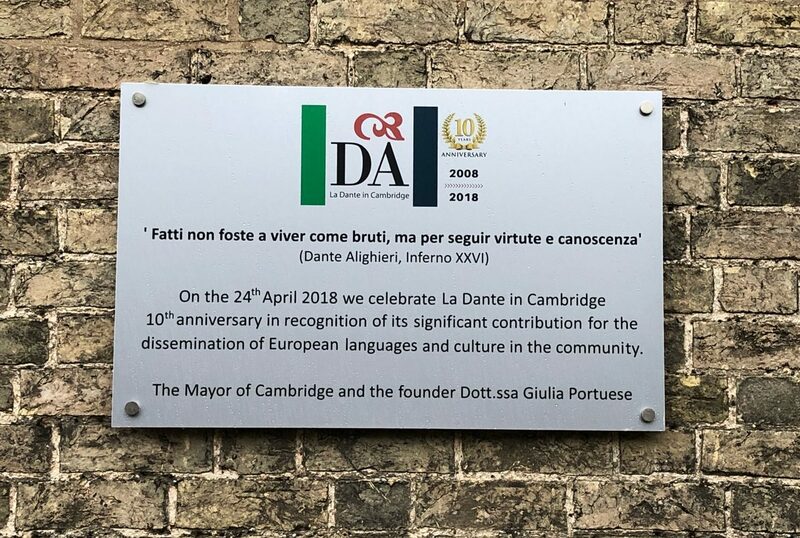 As part of the international organisation La Società Dante Alighieri, which has 500 offices worldwide, La Dante in Cambridge is one of the most prestigious centres in Europe. Its main aim is to promote knowledge and enjoyment of Italian, Spanish, and English language and culture. 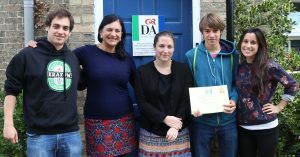 Since 2008 when the Director Giulia Portuese-Williams founded it, La Dante in Cambridge has played a major role in language learning through its unique communication approach and combining language and cultural traditions. Over the years, it has established partnerships with the most important cultural educational establishments in Cambridge, such as the University of Cambridge, Fitzwilliam Museum, Art Language Location, UKTI, Italian Chamber of Commerce, Italian Consulate and Cambridgeshire Chamber of Commerce to support the community in language learning provisions. There is something special about having a group of talented and keen teenagers from Imperia who enjoy a special English experience in Cambridge. A unique one indeed as this summer 2017, they were learning English in the morning and have tennis coaching in the afternoon with other British teenagers. 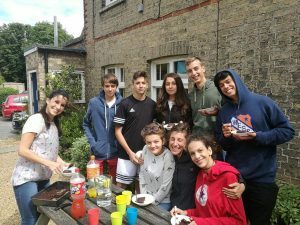 Filippo Rapone, already a keen tennis player from Pisa had a ‘great experience with British coaches from the Cambridge Tennis Academy’ his mum says. The teacher also introduced tennis vocabulary and sport techniques in their lessons, they talked about volley, serves and deuce to say just a few. 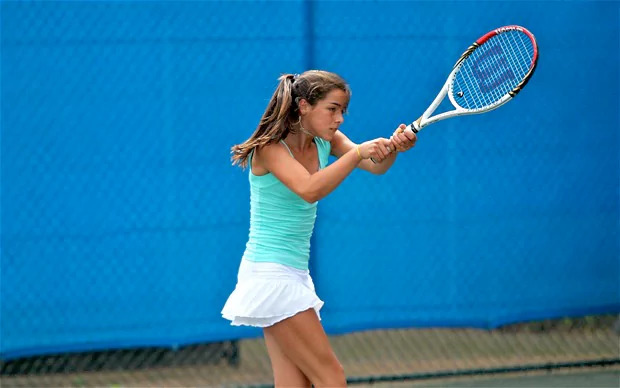 The energy that tennis gave the teenagers inspired them in discussing matches and comment on short championships with their heros from British Andy Murray to Spanish Rafael Nadal. accept responsibilities for their own actions. They have to learn to deal with adversity as well as success and to adapt to different situations and environments. 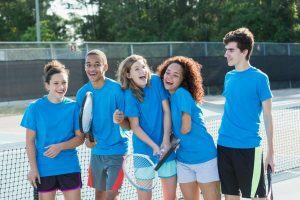 Tennis fosters work ethic, discipline and sportsmanship in teenagers and builds up their strategic and problem solving skills. skills to accept responsibilities, a way to cope with stress, physical and mental plans and strategies on how to beat an opponent problems solving skills. Tennis also teaches sportsmanship at an early age, it teaches teenagers to cope and understand defeat as well as how to deal with success. It builds teamwork in the case of doubles and skills to communicate effectively with a partner. Double and single games were played with local teenagers from a secondary school as well as Rounders. Sophie Stamford and Isabella Pellegrini both studying at Hills Road College in Cambridge gave seminars on the British Education system, meals at the school, the school curriculum. Sophie and Isabella (both bilingual Anglo-Italian students) organised cultural outings with the students at the Fitzwilliam Museum and Archaeological Museum, the funny thing was that only at the end of their stay, our Italian students found out they were bilingual at a game of Rounders, it was truly hilarious. 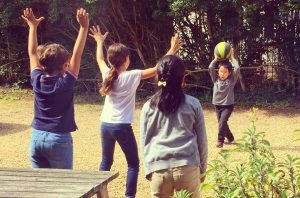 So learning a language at La Dante is not just about studying in a classroom but it’s a continuous, creative, evolving development: through friendship, games and tennis. This year was such a success that we’ll be running more English and tennis summer camps at La Dante next year in 2018 from July 23rd to the 17th June. Molti genitori, pensando al futuro dei propri figli in una societa’ sempre piu’ globalizzata, decidono di fare loro un enorme regalo: l’apprendimento di una lingua straniera. Il bilinguismo è innegabilmente una grande ricchezza, in quanto permette di confrontarsi con lingue e culture diverse dalla propria, aprendo la mente non solo a un nuovo codice comunicativo, ma anche a una maggiore comprensione e tolleranza nei confronti degli altri. 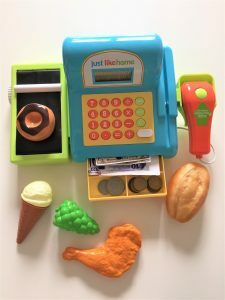 Parlare piu’ lingue, insomma, è una delle abilità più importanti che i vostri figli possano acquisire, fin da piccolissimi. L’apprendimento linguistico durante la prima infanzia è un processo naturale e privo di sforzo, in quanto i bambini sono dotati di una predisposizione innata per l’acquisizione del linguaggio. Infatti, come dimostrano moltissime ricerche di neuro e psicolinguistica, per i bambini e’ piu’ semplice imparare una nuova lingua rispetto agli adulti, poiché hanno una maggiore elasticita’ cerebrale, oltre a una grande capacità d’imitazione e una memoria eccellente. Dal punto di vista cognitivo, questo processo aiuta i bambini a migliorare le loro capacita’ di analisi nelle attività di problem-solving, rafforza le loro competenze decisionali e influisce positivamente anche sul loro sviluppo emotivo, in particolar modo quando l’apprendimento e’ accompagnato da attivita’ ludiche con gli insegnanti e il gruppo dei pari. Inoltre, imparare una seconda lingua da piccoli allena l’elasticita’ cerebrale necessaria per apprenderne di nuove in futuro. E’, insomma, un piccolo grande passo verso molti altri traguardi. In particolare, la lingua italiana e’, per alcuni dei nostri piccoli alunni, la lingua di un genitore o dei nonni, come nel caso di Matilda, che ci ha raccontato orgogliosa che la sua grandma le diceva sempre “ciao bella!” quando la salutava. Insomma, l’italiano come lingua delle origini, ma anche dei bei ricordi delle vacanze al mare, di piatti gustosi e di paesaggi incantevoli. Non finisce qui: imparare l’italiano, infatti, e’ un ottimo investimento, in quanto la nostra lingua e’ da sempre riconosciuta come uno strumento di comunicazione d’eccellenza in moltissimi ambiti: dalla letteratura alla gastronomia, dall’arte alla moda e alla musica, e cosi’ via. I corsi di italiano per bambini alla Dante sono tenuti da esperti insegnanti madrelingua. Negli ultimi mesi, Lucia Vasapollo, Laura Guerrieri e Lucia Casiraghi hanno tenuto corsi individuali e di gruppo, utilizzando un approccio che si e’ rivelato vincente: l’apprendimento linguistico basato sul gioco, in particolare su tecniche di role-play e make-believe. Tutti i nostri corsi hanno avuto risultati decisamente positivi e gratificanti. Con grande attenzione e soddisfazione abbiamo seguito passo passo il processo di apprendimento dei bambini, osservando i progressi di ciascuno e le dinamiche che si sono create tra loro: vedere i nostri piccoli alunni giocare insieme in italiano e assimilare ad ogni lezione moltissime parole, a volte anche apparentemente difficili, per poi riutilizzarle anche a distanza di settimane, e’ stata un’immensa gioia, che ci ricorda come sia per loro facile e naturale abituarsi all’ascolto di suoni diversi da quelli della propria lingua materna e imitarli senza la paura di sbagliare che spesso blocca noi adulti quando impariamo una lingua straniera. Abbiamo iniziato dalle piccole cose, come imparare i numeri da 1 a 10 contando i gradini nel percorso verso la classe. Un’abitudine semplice che pero’ ha creato grande coinvolgimento nei bambini, che ben presto hanno iniziato a ripetere i numeri senza l’aiuto dell’insegnante. Una volta in classe, poi, largo alla fantasia! Le lezioni si sono sviluppate tra giochi di ogni genere, storie, canzoni e attivita’ creative. Le bambole, per esempio, ci sono servite per presentare ai bambini il lessico legato alla famiglia, cosi’ come il cibo giocattolo e il registratore di cassa sono stati utilizzati nella simulazione dell’attivita’ di fare la spesa in italiano. “Gelato”, “mela”, “pane”, “torta”…in pochi giorni queste e tante altre parole parole sono diventate familiari, e tutto questo tramite il gioco. Le attivita’ sono state personalizzate seguendo i gusti personali dei bambini, per far si’ che le lezioni fossero ancora piu’ divertenti e coinvolgenti. Matilda e Florence, per esempio, amano gli animali, il mare e le fate. Proprio questi sono stati i protagonisti dei nostri giochi, insieme alle canzoni italiane per bambini legate di volta in volta all’argomento della lezione. Sentirle canticchiare “La pappa al pomodoro” o “Ci vuole un fiore” mentre giocavano e’ stata una bellissima sorpresa. Tra i giochi piu’ amati, vanno citate le piccole sfide del “chi mi sa dire come si chiama…?”. Con grande tenerezza, abbiamo visto i bambini suggerirsi l’un l’altro le parole italiane per guadagnarsi lo stemma della vittoria. Un personaggio molto amato e’ il pupazzo-marionetta Ippopotamo, che, come i nostri piccoli studenti sanno bene, parla solo italiano e non capisce una parola di inglese. Questo piccolo stratagemma ha fatto si’ che i bambini si impegnassero a rivolgerglisi nella nuova lingua, l’unico mezzo per poter comunicare con questo simpatico amico. L’italiano come una nuova lingua, insomma, ma, come dicevamo, per qualcuno di loro e’ allo stesso tempo una lingua antica, legata alle proprie radici. Cio’ che e’ certo e’ che per tutti i nostri alunni e’ una lingua divertente e impararla e’…un gioco da ragazzi! 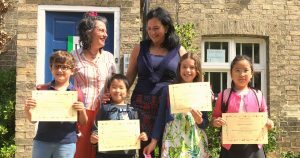 When looking for full immersion for kids in Cambridge, look no further as this year with our English teacher Sima Shimi we had a programme that enhanced the confidence in which our children learned in a fun and effective way. This summer we were fortunate to have kids from Greece, Spain and Japan at La Dante. The parents chose us as we have small classes and English CELTA qualified teachers who use a communication method, use realia and lots of role-play. This summer, as the courses were intensive, we decided to get the children involved in interactive video games from the British Council, Learn with Kids site that allowed them to practice memory games, flash cards, tongue twisters, short stories and a lot more. It was such a good feeling to see Shoichiro Todoroki (Japanese) and Javier Villamayor (Spanish) aged 6 learning so fast: they learned numbers in lots of ways from the small ones 1-10 that they learned going up the steps at the school every day to big numbers that they used with British Council games. 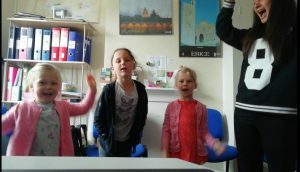 As for Claudia (Spanish) and Sakiko (Japanese) aged 9, they were challenged in the group with memory and shopping games from the British Council Learn with Kids. The younger kids got involved too and learned the vocabulary really fast. The shopping game was very popular of course, they had to use a till to buy toys as well as practicing it with the video game from the British Council Learn with Kids. The involvement of the actual till in the classroom, the toys they liked to buy, the numbers and interactive video games made sure that the kids loved coming over to the lessons, in fact they weren’t lessons in the traditional sense but games, songs and fun based activities with real situations. 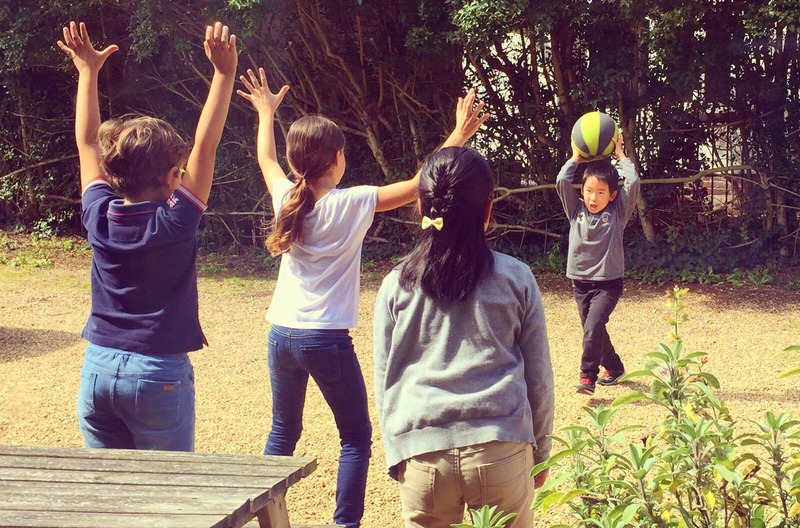 In the afternoon, the children spent time at a local Cambridge British school, attending a playscheme where they play action games, do sport activities like rounders and football with British children of the same age. The scheme has been running for the past five years and the results are amazing. The children make friends, build their social skills in English with other children, choose their games as the Playscheme uses a Montessori approach: the children choose what they want to do in the afternoon, who they wish to play with guided by leaders through the day. There are some international children within their groups. All in all it was a successful summer programme this year too and thank the teachers, the kids and the parents for collaborating, see you next summer!!! …what a wonderful time Javier and Claudia had at La Dante in Cambridge! Thank you so much for making possible this wonderful experience for my children! Sakiko and Shoichiro enjoyed their English class very much, fun based English, nice friends and their teacher was very kind to them. Thank you very much! You might be wondering why anyone would go through the discomfort of trying to think in a foreign language, especially during the early stages or learning. Well, for starters, thinking in the language you’re trying to learn is one of the easiest ways to review the vocabulary and grammatical patterns you’ve recently acquired. Plus, by actually forcing your brain to think in a language it is not used to think in, you’ll also help activate the newly-acquired information by giving you a real-life use for it. This, in turn, will speed-up thepassive-to-active vocabulary transition. In a nutshell, passive vocabulary includes the words stored in verbal memory that people partially “understand,” but not well enough for active use. So you might know the word for “vocabulary” in Spanish (vocabulario), for example, but you might not be able to plug it in a sentence of your own yet if you’re a beginner. Your active vocabulary, on the other hand, includes the words that you canreadily use when speaking and writing. Another great reason to practice thinking in a foreign language is that, according to a study conducted by University of Chicago psychologists on how language affects reasoning, you will make decisions that will tend to be less biased, more analytic, and more systematic. Why is that? “Because,” according to the study’s lead author Boaz Keysar, “a foreign language provides psychological distance.” So by thinking in a foreign language you will not only be jump-starting your skills in that language, but you’ll also make smarter decisions. Talk about a no-brainer! 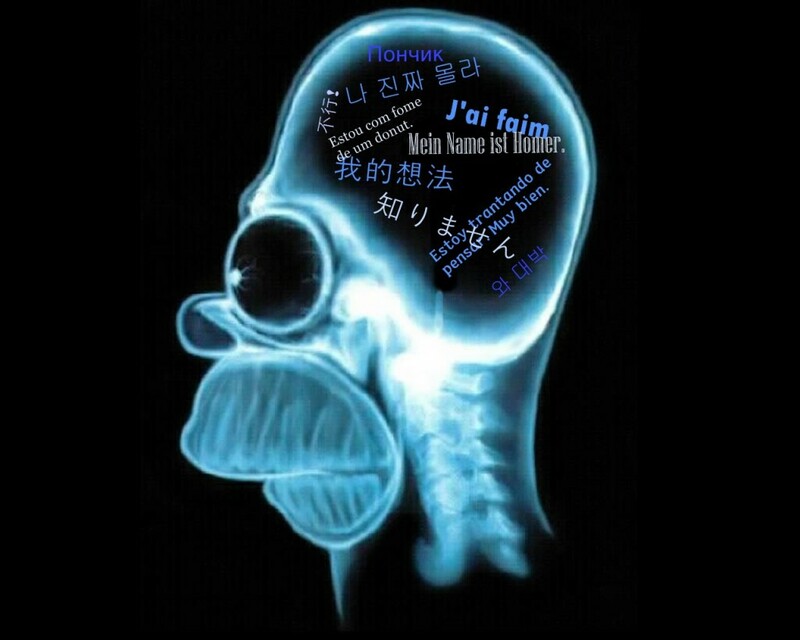 So how can you actually start thinking in a foreign language? Is it something that will magically happen after having gone through your 10cm thick textbook? Chances are that won’t happen, unless you make a conscious effort to make it happen. So here are a few tips that I’d like you to try to implement in your daily life. #1: The first thing that’s really important to do is to create a language bubblearound yourself, especially if you’ve reached an intermediate level or anything above that in your target language (but really, the sooner the better). I’ll go a bit more in detail into this in the “Making the Language a Part of Your Life” section just down below, so don’t stop reading just yet! #2: The second step is to start making a conscious effort to describe things around you in your target language. One easy way to start when you have a very limited vocabulary is to just look around your room, your neighborhood, and your workplace/school and mentally label whatever you can. If you know colors, scan whatever is around you and think the word for the color of each item you see. If you have recently been learning about furniture, adjectives, or moods, try the same thing with those. Whatever vocabulary and grammatical patterns you are currently learning at the moment, make a conscious effort to think in your target language using those newly-acquired tools. See it as a game, something to enjoy doing. As you begin to increase your vocabulary little by little, start gradually increasing the complexity of your thoughts by making phrases and by describing what’s going on around you. Don’t jump steps and try expressing complex thoughts that are in sharp contrast with your current level, though. For example, don’t try to say “I wish I would’ve been there” if you are still a beginner in your target language, because the grammar involved is too complex. Instead, simplify what you want to say. You could say something like “I want to go there,” or “I wanted to go there but I couldn’t.” Don’t worry, in due time you’ll reach a point where you’ll be able to say more complex things, there is no rush! #3: If you are a bit more advanced in your target language, as you go about your day try to think through some typical conversations you would normally have in your native tongue. As you’re leaving your apartment, your neighbor greets you. What would they have said and how would you have replied in your target language? On the way to work, you stop to buy a cup of coffee. How would you order that in your target language? If there are some common words and expressions that you find yourself unable to express, especially on repeated occasions, write them in a small notebook or in your smartphone, and in the evening find the translations. That’s an extremely useful way to quickly gain useful vocabulary that you know you are likely to use in everyday situations. #4: The last tip here is to speak to yourself or to a camera. If you are ready to put aside your shame, and especially if you don’t have roommates or family members nearby to eavesdrop on you (! ), it’s also quite useful to talk to yourself. Aside from being useful in organizing your thoughts, it also allows you to practice pronunciation. If you don’t like the idea of talking to yourself, why not make videos of yourself talking to track your progress? You can organize your videos around themes. For example, in one you might try to talk about the weather, and in another one you might tell your real or fictitious listeners how you began the study of your target language, or which methods you’re using at the moment. Countless language learners and seasoned polyglots do exactly that and regularly post their videos on YouTube. If you do the same, you’ll kill two birds with one stone and be able to connect with other members of the language learning community. In short, if you want to start thinking in the target language you’re learning, you have to get out of your comfort zone and make the foreign language a part of your life. Don’t be afraid, I promise nothing bad will come out of it! It’s something we all hesitate to do because we are all afraid of the unknown, and we are all afraid of having a feeling of discomfort. Staying in your language bubble and in your comfort zone are easy options, but they are unfortunately not what will bring the best results in terms of foreign language fluency development. Many people—in fact most people, it seems—approach language learning in a very, how should I put it, “confined” manner. What I mean by this is that they see language learning as something to be “studied” or “learned” during a certain period of time during the day/week, and then everything else they do is somehow totally unrelated to the language they are learning. I often ask my students what they do outside of class to improve their language skills. Nine cases out of ten, they either do nothing or study a bit through their textbook. They basically pat themselves on the back for paying for language lessons, and as soon as the lesson is over they somehow turn a switch in their brain which means they can totally forget about the language they are learning. Many students later wonder why they aren’t somewhat fluent after studying the language for years upon years. I’ve thought about it and I think that the reason why many people recommend to go abroad to learn a foreign language is that it kind of forces yourself to step outside of your native tongue bubble (although many expats still manage the amazing feat of staying inside their native tongue bubble for years, despite living in a country that speaks an entirely different language). If you go to Spain, for example, you’ll be forced to hear Spanish on the streets, to read signs in Spanish, and perhaps even to listen to Spanish TV and, who could’ve imagined, meet Spanish people who speak Spanish. 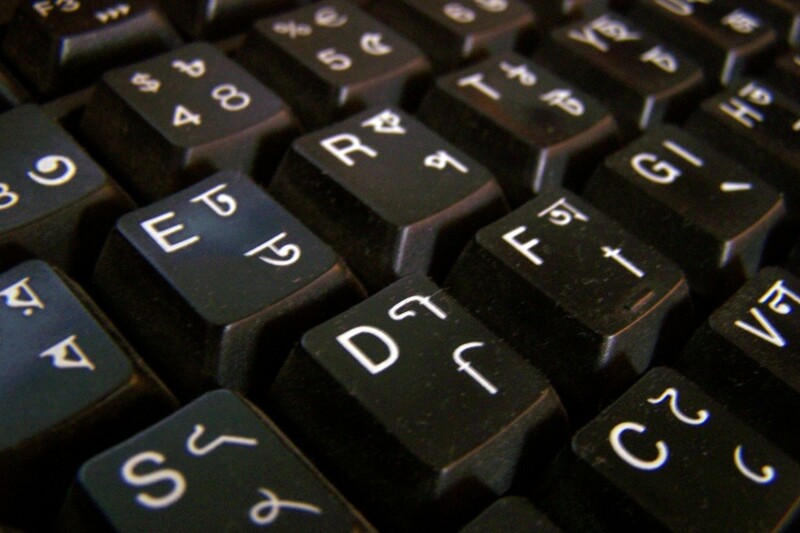 #1: Start reading the news and/or blogs in your target language. To get into the habit of doing so, make your homepage (when your browser starts) a page that is in the foreign language you are learning. For example, every time I open Firefox, I get to see the news in Korean. I just can’t avoid it. I also try to avoid watching the news in English. 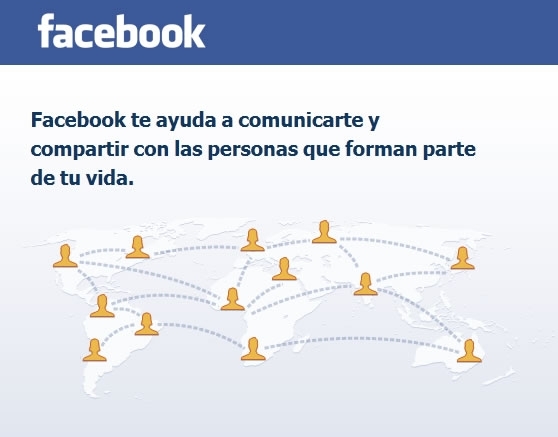 Or what about Facebook? YouTube? Movie players? These are all websites or programs that have a changeable language option. #2: If your phone has a “language” option, change the language of your phone to the language you are learning. At first it will be really uncomfortable, but the necessity to understand your phone’s function will soon be strong enough so that you’ll have no choice but to remember a whole lot of new words and become proficient in using your cell phone in a foreign language. I’ve recently switched my phone to Korean and frankly, I don’t know why I didn’t do it earlier. #3: Watch movies in the target language. When you watch movies in your own language, try to watch them with subtitles in your target language. For example, if you are learning Spanish but decide to watch an American movie, either try to find the same movie dubbed in Spanish, or get the subtitles for it in Spanish. As you listen to the movie, you’ll be reading the entire time in Spanish. This will also tremendously help to increase your reading speed. #4: The next time you need to install Windows on your computer, ask somebody who speaks your target language to download the version in their language. Just as with a cell phone, it will be really uncomfortable at first, but you’ll get used to it eventually. The same can be done whenever you download programs such as movie players, etc. If you’re still a beginner, that’s not necessarily recommended, but for intermediate learners and higher, it’s worth giving it a try. #5: Watch YouTube videos in your target language. We all have the urge to do something completely unrelated to the task we have at hand. This is called procrastination. Kill two birds with one stone byprocrastinating in your target language. You’ll be watching stupid videos, but at least they’ll be in a foreign language. Watching stupid stuff in a foreign language is cool. #6: Listen to music in a foreign language. Not only you will discover new, awesome music, but you’ll be getting used to the language’s flow, intonation, and rhythm. If you feel like it, get the lyrics and sing along your favorite songs. By the way, I’ve recently written a guest post about Korean music on Susanna Zaraysky’s blog. If you’d like to discover new music, check it out here! #7: Meet friends who speak your target language. 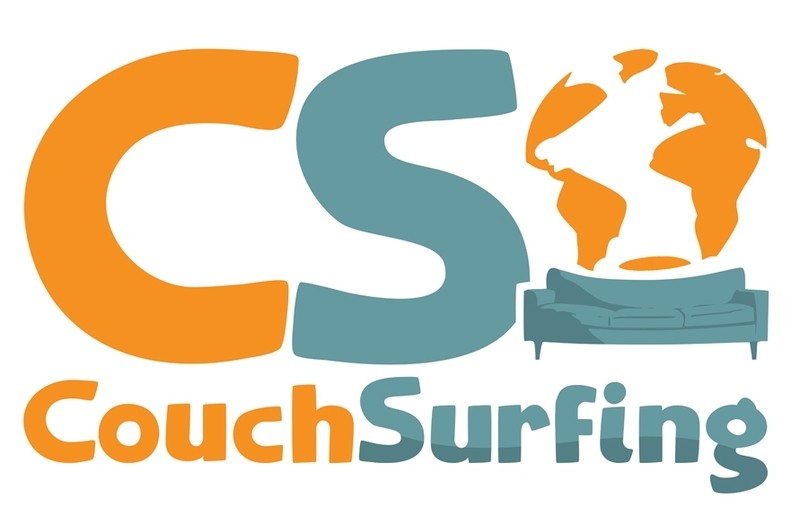 Visit a website such as meetup.com or Couchsurfing, join a local club, volunteer, make a language exchange partner online. Whatever you do, remember you have dozens of ways to get to speak in your target language. No excuses. What do you think? Have you ever tried to force yourself to think in a foreign language? How much are you willing to get out of your comfort zone? What steps are you actively taking to make the language you are learning a part of your life? 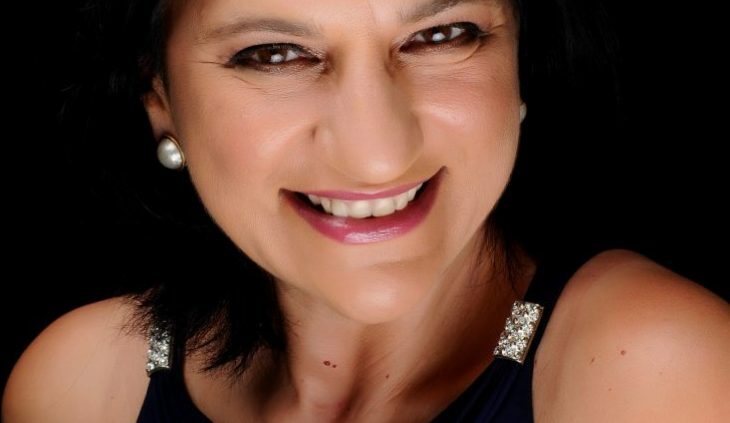 By implementing only a few of the many tips I’ve given you today, I am confident that you will see, within a short period of time, a dramatic change in your fluency and in your ability to think in your target language. See it as a game, and as a way of pushing yourself and making language learning more than something that needs to be “studied”. Remember, it’s all about having fun and challenging yourself!